The Oscars are this weekend and now it is time for my own personal movie awards, beginning with my ten favorites moments or scenes in movies that came out in 2012. Some of these reveal major plot points, so spoilers ahead. Some may be violent or feature graphic language. Please watch with caution. Really a concept like no other, Sound of Noise features a group of musical terrorists attacking the city because of its terrible taste in music. While thematically it falls a little flat, the sequences in which they are performing these attacks are amazing. Here, they rob a bank only to put on a concert only using things found within the bank. The opening sequence is fantastic, as is the fight scene, but my favorite was the arrival at Skyfall. As they arrive they plot how they will face-off against the super villain played by Javier Bardem. This one really makes the list for me, because of all its coolness. It’s as if Kevin McCallister grew up, joined the British intelligence, and became the renowned James Bond. 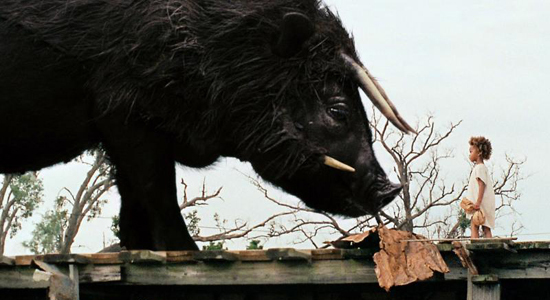 Another movie that contained several wonderful moments (the opening montage as well as the dance with the surrogate mother of sorts), but the closing of the film with Hushpuppy standing up to the giant Aurochs who haunt her is probably the most epic of all scenes this year, and certainly the most touching on an epic scale. She faces her fear of being forgotten, while making peace with her father, and really it is beautiful. Anders sits in a cafe listening to all those around him. He has just essentially sabotaged his shot at a job because of his insecurities and inability to forgive himself for all the pain he’s caused everyone around him. The camera shifts from viewing just him, to all those that surround him, seeming to, if only for a moment, give a picture of hope. It tells a story of a world, a city, that is bigger than just him or really us. The whole movie builds to this moment after showing what didn’t become of Rodriguez life, it pulls us into this wonderful scene where he is finally able to bask in the accolade he has had his entire life, but never knew it. It is a wondrous moment not only for Rodriguez, but also for all the fans whose life he had touched, but never knew anything about him. There are so many moments from this film that could be chosen. Seth’s death, the discovery of the Rainmaker, the cafe scene, or the wonderful ending, but I decided to go with a montage of scenes that are abruptly cut to. In a few minutes we are given the entire life of our protagonist, from retirement to his downfall and redemption. It is a great piece of editing, with an entire backstory explained in a matter of minutes. Pitch Perfect is an extraordinarily silly film, and it bathes in this fact, also winking at you, ignoring any real stakes or plot points for little jokes and great song performances. The riff-off is the film at its best bringing one of the most full of joy, pure fun moments of the year. It shows just how wonderful pop music can be as a cultural unifier as each group sings off of each other going through a plethora of songs and subject matters. So much fun. The film features mostly men arguing over horrific deeds in the dark night, with light used only to illuminate where the potential dead body is located, but once they take a break from their search, stopping to eat and have tea, a new light appears only for a few moments. The light illuminates a beautiful young girl as she serves each man, each man stops, unable to speak as they are served. Some are even brought to tears. The light illuminating the darkness, exposing all in a graceful manner. The most fantastic, jaw opening scenes of the year, and I’m not even a horror fan. The whole film has been building toward the secret lair, and it all unleashes in one swoop citing references from years of film history. It’s both hilarious, exciting, and horrifying. Caution: The clip below features graphic violence. This scene is like an acting duel from two of the finest, most intense actors playing two of the most intense characters of the year. The first showdown of many, one that shows their rivalry, but also their strange understanding and need for one another. Joaquin Phoenix’s concentration and shift from silly to loyal follower is the most memorable of the year. Caution: Graphic language and content.